The ultimate calculator: rotate your phone between a basic and a very capable scientific one. 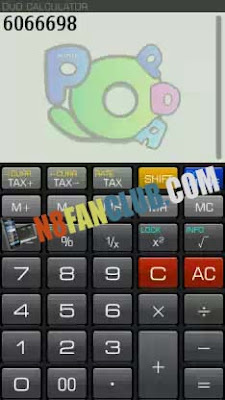 The basic phone has normal and financial calculations: VAT,currency, fixed decimals, scrollable multi-line display. The scientific one has seven modes: normal, engineering, scientific, fixed point, complex, programmer’s, statistics; 32 true decimal places; root, exponential, trigonometric, hyperbolic, complex satistical functions and many more.